Le nez est élégant et très mûr sur les fruits confits. La bouche est ample et ronde, très élégante avec une bonne minéralité. Ce magnifique millésime est prêt à boire maintenant. Thick, rich, ripe and opulent white, with spicy exotic fruit, sandalwood, butter, popcorn, faded flowers and a lack of crisp acidity. Harmonious, full-bodied. A bit hot on the finish, but fabulous mouthfeel, with that amazing thickness from start to finish. Drink now through 2012. 1,915 cases made. 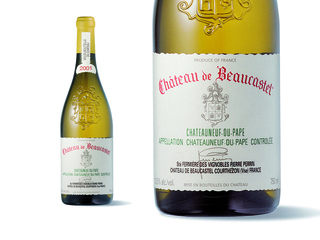 The 2001 Chateauneuf du Pape blanc (80% Roussanne and 20% Grenache Blanc, Picardin, and Bourboulenc) is a buttery, smoky, rich example with a mineral-like intensity, full body, and lavishly rich flavors that coat the palate with honeysuckle, marmalade, and glycerin. It should drink well for 10-15 years.